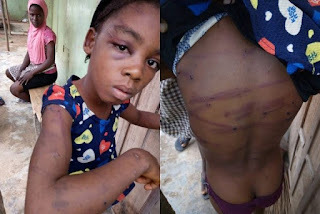 A Facebook user, Olagunju Adekunle shared a story of a little girl who was merely beaten by her father for watching TV in a neighbor’s bouse, leaving bruises all over the girl’s body. 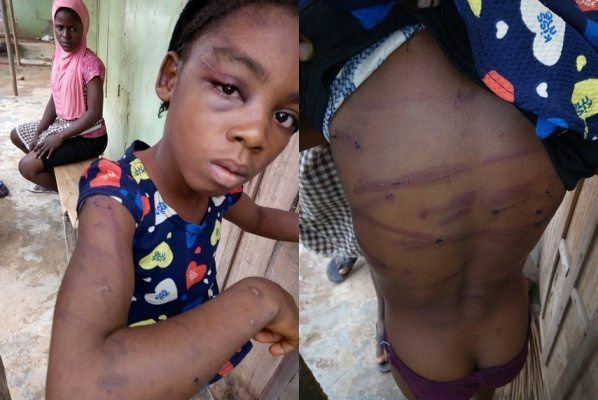 “God, I can’t just believe this in my life,i was driving to the office this morning and I’ve a reasons to make a call and before I know,I was out of call card ,as I alighted from my car to get a recharge card ,I sighted this small girl(Esther by name) be beaten mercilessly with his heartless and reasonless father. “Please where are the human right, who can be of assistance to help this girl out of her heartless father? I was so fortunate to interrogate her mother who told me that the girl went to the next neighbour room just to watch TV. “I took the girl to the nearby police station on our way getting there ,the girl and her mother was redirected to the nearby police station which is very closer to their house.